This Italian Style Wontons recipe is a take on Asian wontons. They are great cocktail hour appetizers!Note: You can change the number of people served by placing your cursor over "Servings". The Ingredients will adjust to the new number of servings. Preheat oven to 300 degrees F. Combine mozzarella cheese, basil, walnuts, dried tomatoes, ripe olives and green onion in a small bowl. For each wonton, place one wrapper on a flat surface......Oh well, it's best you watch the video...click HERE. Heat 2-inches of cooking oil to 365 degrees F, in a heavy saucepan or deep fryer. Fry wontons, a few at a time, for 1 to 2 1/2 minutes or until golden brown. Drain on wire rack. 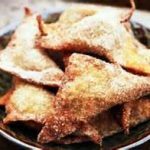 Keep fried wontons warm in a 300 degrees F oven while frying remainder. Heat marinara sauce to serve for dipping.